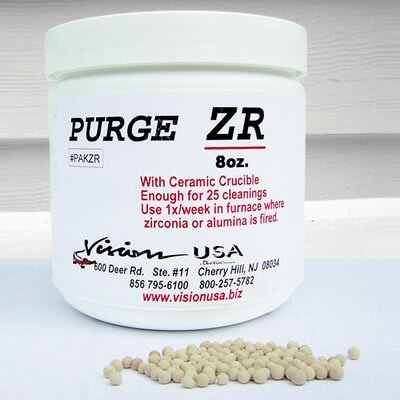 Vision USA is pleased to annouce their latest new product offering, Purge All ZR zirconia furnace decontaminator. Purge All ZR is a unique double activated ion and oxide absorbing material especially manufactured to eliminate all contaminates that cause discoloration and porcelain delamination in zirconia copings. Low levels of radioactive materials found in zirconium can build up inside a muffle and cause color problems. Purge All ZR will extend muffle/thermocouple life and maintain thermocouple accuracy.